Note: The Canon EOS 7D has been replaced by the Canon EOS 7D Mark II. The Canon EOS 7D is without question, the best APS-C sensor-sized DSLR Canon has ever produced (as of this review date of course). And of course, "best" is a vague word. Let me use seven or eight thousand words to clarify that sentence. The 7D is the first model of a new camera line. Under Canon's current naming scheme, the first clue as to where the 7D fits in Canon's lineup is in the model number itself. The fewer digits in front of the D, the higher the camera line. Once 1 digit is reached, the lower the number, the higher the camera line (this is reversed for the zzD, zzzD and zzzzD lines). Canon's 1D-Series line is the best available. So in this case, we have a single digit line (the best), but a higher number within the single digit lineup. In short, this is a very high end DSLR and the only single-digit model with an APS-C-sized sensor. This camera is "... poised as the ultimate step-up camera for serious photographers or a second camera for professionals in the field." (Canon) While it may be a second camera for many professionals, because of the features-to-price ratio, I think it is going to be the first camera for many as well. 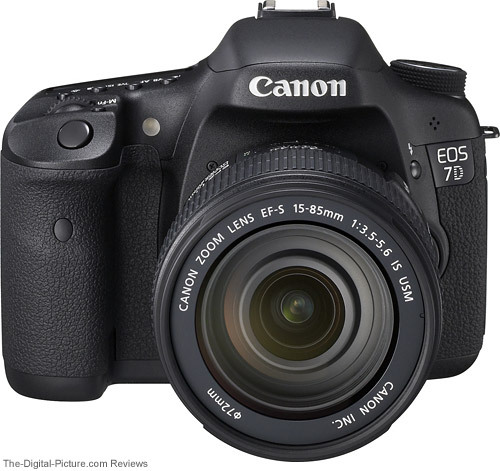 What we also have with the Canon EOS 7D is the shortest Canon EOS DSLR name since the Canon EOS 5D. That feature alone is refreshing. Though it is a higher end model, the 7D is most similar in size and function to the most-current-at-review-time zzD model, the Canon EOS 50D, the camera I'll most frequently compare the 7D to in this review. 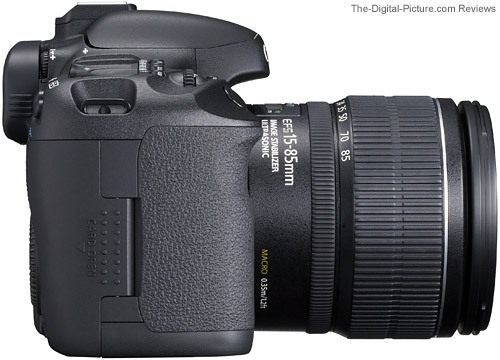 Like the 50D, the 7D shares the APS-C-sized sensor and accepts both EF and EF-S lenses. Here are some specs for comparison. The 7D's additional resolution over the 50D can be seen using the mouseover feature in this Canon EOS 7D vs. 50D resolution comparison using an ISO 12233 Chart. While the 50D is slightly sharper than the 7D in these identically processed, very low sharpness setting ("1" in DPP) results, the 7D clearly shows more resolution - and can have additional sharpening applied as I'll demonstrate later in the review. Eighteen megapixels of quality image is a very strong 7D feature. The camera looks nice too. Let's review noise next. Following are a pair of 100% crop comparisons between the 7D, 50D, 5D II, 1D III and Rebel T1i/500D. Comparing apples to apples. If you have read any of the site's other recent Canon EOS DSLR camera reviews, you will recognize the following color block test that clearly shows and compares sensor noise. If you read the image quality discussion on that page, you can skip down to the scene comparison. I'm particularly impressed at the Canon EOS 7D's noise performance against the 50D. Comparing the gray blocks at the top of the 50D's image shows the 7D to have a slight advantage over the 50D at ISO 800 that builds to a solid advantage at ISO 3200. By ISO 12800, the 7D solidly outperforms the 50D. To my eyes, the lower model line T1i/500D falls in between these two DSLRs in this comparison. With their larger sensors, the 1D Mark III and the 5D remain better low light imagers - though the much lower resolution of the 1D III is quite apparent in these comparisons. The with-noise-reduction examples have a range of noise reduction added - from 1,2 (Luminance, Chrominance) at ISO 100 up to 8,16 at ISO 12800. These examples clearly show that noise reduction reduces the visible noise - and reduces the fine details as well. The 7D images are softer than the other DSLRs at the same sharpness setting - repeated testing confirms this. There is no focus error here and the examples use an aperture wider than the DLA. A set of examples processed at a DPP sharpness setting of "2" shows similar sharpness to the T1i and 50D. Also noticeable is that sharpening sharpens the noise which makes it more apparent. Thus, equal sharpness results in the 7D losing some of its lead in the high ISO noise comparison. Once again, many comparisons can be made. In this example, the fine details of the fabric better-hides the high ISO noise. The Canon EOS 7D shows a slight resolution increase over the 50D, but again, appears slightly less-sharp at the "1" sharpness setting. Even though the 50D image is slightly sharper, the 7D image is still better than the 50D uprezzed to 7D dimensions. Honestly, the resolution differences are not huge and in my opinion, not a good reason alone (there are many other good reasons) to upgrade from the 50D to the 7D for most. A sharpness setting of "2" helps the 7D a lot in this example. The 5D Mark II, on the other hand, is a clear winner in this comparison. From a noise perspective, my personally acceptable high ISO noise level has long been ISO 1600 with ISO 3200 for emergency use. I'm slowing moving my bar up to ISO 3200 as some of the latest DSLRs are delivering decent results at this level. That said, the biggest 7D noise improvements over the 50D are at levels that remain very noisy. 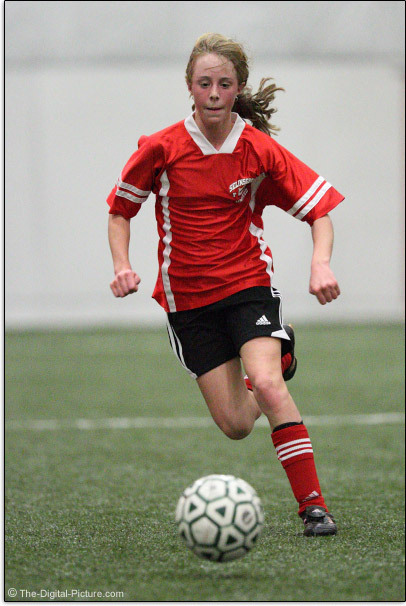 And that said, I shot an indoor soccer match in a horribly-lit gym using the 7D and Canon EF 200mm f/2 L IS USM Lens. I needed ISO 6400 to get a 2/3-stop underexposed image at 1/800 and f/2. The results are not portfolio quality, but the shots are obtainable. This shot was cropped (fixed focal length lens used from a fixed location usually means cropping) to 4059px high and then reduced to the size you see above (600px high). This is about equivalent to a 4x6 print using my monitor. It would make a nice print for the album or photo book. The higher ISO settings indeed extend the usefulness of the camera. I have had a lot of questions about the sharpness of the 7D images appearing in the comparisons I posted prior to completing this review. In all cases, in the 7D images are slightly less-sharp than the 50D images when processed with identical settings. Here is a another look at the sharpness and resolution differences between these two cameras. I'll also include the 5D Mark II in this comparison. The above images were captured in RAW format by the referenced EOS body and the impressive Canon TS-E 24mm f/3.5 L II Tilt-Shift Lens at f/5.6 and processed using the Neutral Picture Style. The sharpness setting is "1" (very low) with the exception of the "S=" examples that indicate the sharpness setting used to process them. My perception is that, at a sharpness setting of "2", the 7D image is similarly sharp as the 50D image. And at a sharpness setting of "3", the 7D image is similarly sharp as the 5D Mark II image. I'm guessing that the 7D's anti-alias filter is a little stronger relative to the individual pixels on this sensor compared to the T1i or 50D. And that the 50D and T1i's anti-alias filter are a little stronger relative to their individual pixels compared to the 5D II and some other prior DSLR models. Since the same camera position was used for all shots in this comparison, the AOV (Angle of View) difference between the APS-C / 1.6x FOVCF and full frame bodies can be compared (top mouseover bar). The above comparisons also shows the difference in sensor density. The higher resolution 5D Mark II image has smaller details than the 7D and 50D in the above example. It has more pixels overall, but they are spread out over a larger sensor. If you are focal length limited (can't use a long enough focal length lens and therefore the final image will need to be cropped), the 7D's denser sensor will deliver the largest image details for you. There is of course more that a camera can contribute to a great image than sharpness, resolution and low noise. Proper exposure is required. I have been watching Canon's auto exposure systems improve over the years - they keep getting better. New with the Canon EOS 7D is the 63-zone iFCL (Intelligent Focus, Color, Luminance) Metering System that takes focus, color and illumination into account when establishing the proper exposure. Because there are an infinite number of situations to present to an AE system, complete comparisons are nearly impossible to perform, but, my strong subjective opinion, after 9,384 shots (though a percentage were taken using manual exposure), is that the 7D's AE system is the best I've used yet. I prefer to use manual exposure settings when possible, but there are times when auto exposure is the better option - such as when shooting under changing light conditions. 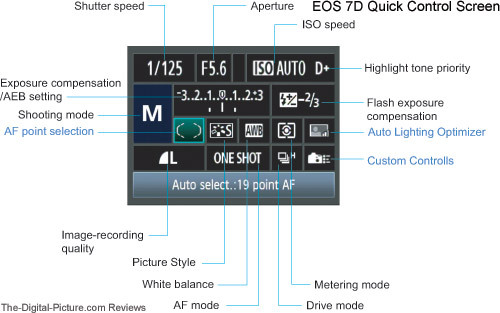 An upgraded 7D feature that utilizes the iFCL Metering System is Auto ISO. And the 7D finally gives me the full Auto ISO feature I've wanted for a long time - Auto ISO that uses the full range of ISO settings in most modes (starting at ISO 100 and going through ISO 3200) including M mode. This creates what is essentially an Aperture AND Shutter Priority Mode. I can dial in the M mode fixed aperture and shutter speeds I want and let AE determine the ISO setting needed. 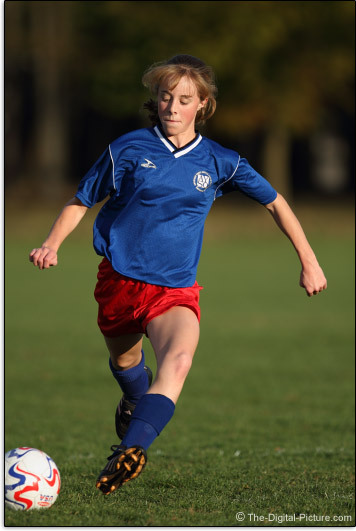 I can set the shutter speed I need and the aperture I want to track sports players from shade to full sun, under changing skies and with a rising or setting sun without exposure setting worries. Very nice. It is especially good that AE works well because there is no provided way to set exposure compensation while using this combination - a shortcoming that Canon will hopefully address in their future bodies. Auto white balance also seems to improve with subsequent DSLR models. And again, infinite situations and a subjective evaluation - I think the 7D does a very good job with auto white balance. One specific test I made was using a single standard tungsten light bulb to illuminate a small scene in the house. AWB from the camera delivered the equivalent of 3200K when compared in DPP - excellent and a big improvement over any Canon EOS body produced to date. That the 7D has Canon's best-yet AWB is my impression. If the shot is OOF (Out of Focus), the best image quality in the world is not going to save the shot. I will always welcome AF (auto focus) improvements and the 7D has indeed received many. 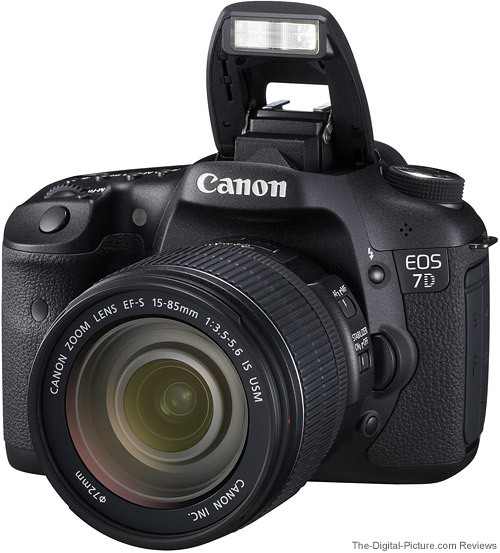 According to Canon, "The Canon EOS 7D boasts the most advanced AF system ever seen in an EOS SLR. The completely re-designed system includes a new multi-axis cross-type 19-point AF grid, where the focusing points are evenly spread out across the image plane and clearly displayed through Canon's new Intelligent Viewfinder. All 19 points are f/5.6-sensitive for both horizontal and vertical cross-type focusing [a first], while the center AF point adds high-precision diagonal cross-type sensitivity for f/2.8 and larger aperture lenses." (Canon USA Press Release) The 7D requires a lens with a maximum aperture of at least f/5.6 or wider (as reported by the lens) for AF to function. Note that the total AF point coverage area is not wider than even the 40D's coverage area, but the density is far higher - as can be seen in the images below. New AF area selection modes are also available. Spot AF mode reduces the size of a single AF point making it easier to select the precise part of the subject to focus on - such as your subject's eye. AF Point Expansion mode uses a set of AF points adjacent to the selected AF point to assist focusing on moving subjects. A range of examples are presented below. Like a subset of the all-AF-points-active Automatic AF point selection setting, Zone AF divides the 19 AF points into five selectable focusing zones. 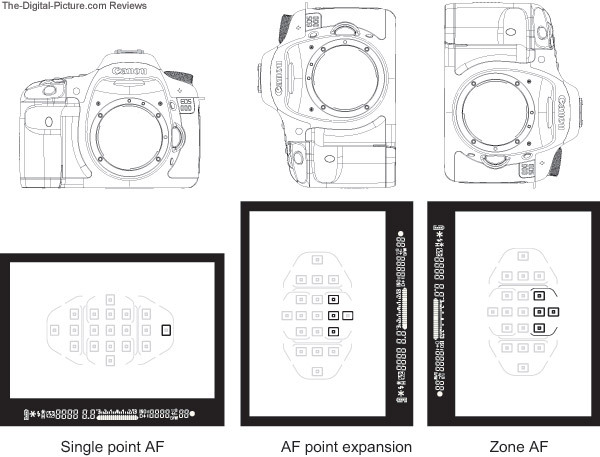 All focus points in the selected AF Zone will be used to determine the proper focus distance. Automatic AF point selection now allows any specific AF point to be selected for initial focus acquisition in AI Servo mode (the center point was required to be used for all prior Canon EOS models). The 7D will then track the subject over all focus points as prior models did. In AI Servo mode, all Canon DSLRs attempt to predictively focus the attached lens at the precise location the subject will be at the moment the shutter opens. The 7D takes this functionality farther by recognizing when a macro lens is attached and adjusting the tracking function to account for the quick forward/backward focus adjustments necessary during macro photography. I didn't shoot a comparison with the 50D or other models, but did shoot lots of AI Servo macro shots with the 7D and the also-new-at-review-time Canon EF 100mm f/2.8 L IS USM Macro lens with very good results. Combining the 100 L's IS and the 7D's macro AI Servo functionality makes it easy to concentrate on having the exact desired framing when the shutter release is pressed. The above graphic depicts 3 of the 7D's AF modes (single point, expansion and zone) along with another new feature - AF Point Switching. AF Point Switching allows one AF point to be selected for horizontal compositions and a second AF point for vertical shooting. Canon's DSLRs typically perform very well in One Shot AF mode. The 7D focuses very fast and very accurately. The 19 cross-sensitive AF points seem to consistently lock on their target. All is well in this regard from my perspective. AI Servo AF performance is often a big differentiator between bodies. AI Servo AF performance is also very hard to fully evaluate - simply because there are, again, an infinite number of situations that can be presented to the AF system. My subjective evaluation, based on shooting many thousands of frames at dozens of soccer games along with other situations, using the best available sports lenses (including the Canon EF 200mm f/2 L IS USM Lens, Canon EF 300mm f/2.8 L IS USM Lens Canon EF 400mm f/2.8 L IS USM Lens and Canon EF 500mm f/4 L IS USM Lens), is that the 7D delivers the best AI Servo focus performance of any of the Canon APS-C sensor bodies. My experience is that the 7D does not perform quite as well as the 1-Series bodies in these situations. The percentage of OOF shots (they tend to be focused behind the direction the subject is traveling) I experience with the 7D is higher than I experience with the 1-Series bodies. Said another way, if your living depends on your ability to capture action quickly moving toward or away from your camera, I recommend that you get a Canon 1-Series body. If you can afford to have a somewhat higher percentage of missed shots in these situations, the 7D performs very well for the price - better than any other Canon APS-C body I've used to date. The 7D's AI Servo tracking sensitivity is able to be set via a custom function. I have ended up with my 7D's AI Servo tracking sensitivity turned up to fast and feel that I am getting a slightly higher hit rate on what I'm shooting at this setting. The 7D utilizes Canon's new Intelligent Viewfinder which uses a liquid crystal overlay to provide various displays of focusing points and zones, on-demand grid lines and a spot metering circle. The LCD overlay can also be illuminated or turned off completely. 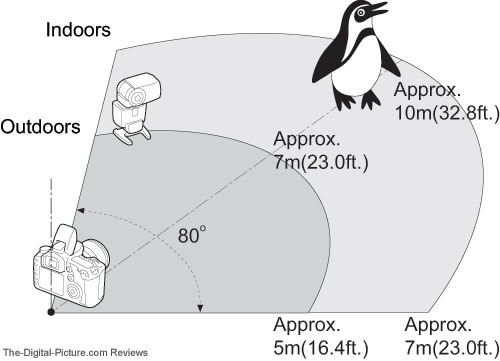 As noted in the first chart in this review, the 7D viewfinder provides 100% coverage. Canon USA specifies the coverage as "approx. 100%" and that is more accurate as it is close-to-but-not-quite 100%. My viewfinder coverage determination came when I was framing a test target. The initial alignment was done with the viewfinder and final alignment was done with Live View. In Live View, I could see a little more target border than in the viewfinder. I didn't find the difference to be very significant. Being able to see the entire frame in the viewfinder is a big advantage. You are no longer guessing where the frame edges really are during composition. You heard that right - a couple of paragraphs ago, I said grid lines - grid lines can be turned on in the 7D's viewfinder. I have grid focusing screens installed in most of my actively-used DSLRs. You see, I suffer from HLD (Horizon-Level Deficiency) syndrome. It seems that no matter how hard I try to keep the horizon level, I still don't get all scenes framed perfectly level. I turned the 7D's grid lines on and haven't turned them off since. Great feature - saves the purchase of an accessories screen for me. 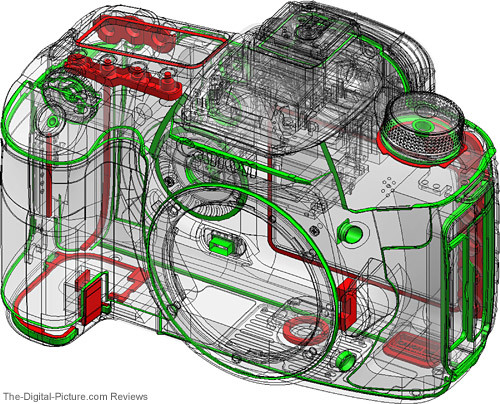 Another HLD syndrome help is the Canon EOS 7D's new built-in Dual-Axis Electronic Level rated at ± 1 degree. I have bubble levels on my tripod legs, my self-leveling tripod base, my tripod head and on my tripod clamp. Problem is, they are not all correct for all of my DSLRs. They may be close, but not always right on. My hotshoe bubble level is the most-consistently-correct level and this is only right on when installed in a specific orientation (and only works if I don't forget it or lose it). Forget all that - this camera has a built-in level that is accurate - laser confirmed. While the 7D can indicate both pitch and roll level using AF points in the viewfinder, pressing the shutter release turns off the display. So, using it this way requires manual focusing (or prefocus with AF and then turn on MF) or turning off the AF function of the shutter release (use the rear AF-ON button for AF). Better in both display and functionality is the Live View implementation as seen below. Keep your horizons level and your vertical lines straight up and down. 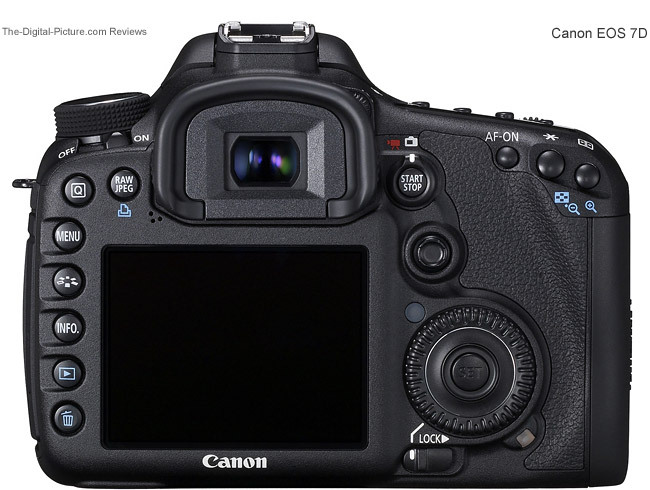 Obviously, the 7D has the Live View feature found in all of the latest Canon EOS bodies. It's a great feature - I use Live View a lot for still life, product and landscape photography. Live View of course uses the rear LCD and the 7D gets a new one of these. This is a clear 3" solid structure Clear View II LCD screen with 920,000 dot/VGA resolution. Gone is the resin LCD cover - replaced with a reinforced glass cover and clear filler that eliminates the air gap between the glass and the LCD under it. The benefit is less glare, enhanced clarity (especially in a bright environment) and better color. And, while I didn't test this aspect personally, this is also said to be a stronger design. It looks great and even though it has the same display size as the other Canon 3" LCDs, its reduced border size claims less space as can be seen in the comparison below. A lot more than the LCD has been changed on the back of the 7D compared to the 50D (again, the DSLR I'll be referencing when talking about changes below) and the other above-compared DSLRs. First, the power switch is no longer part of the RCD (Rear Control Dial) on/off switch. The power switch is now located at the top left of the body. Although I occasionally do not move the 50D switch far enough to enable the RCD when powering the camera on and am left wondering why the RCD is not working, I personally do not find the new arrangement to be an advantage or disadvantage. What would be better for me personally would be to remove the RCD on/off switch completely as I never turn off the RCD. Put it on the menu. I assume not all would agree with me on this one - or the switch would probably not be there in the first place. The already-discussed larger viewfinder is recognizable by the larger bulge on top of the camera. Next change: Many of the buttons have been moved from the bottom to the left side, were enlarged slightly and now live in slightly recessed channels. This is a better position for them - a welcome change. The Func. button is gone. A new RAW/JPEG button forces a single RAW PLUS JPEG capture (reverting back to the previous setting after the shot). The RAW and JPEG quality settings for this function are set in the menu. A new Quick Control Button ("Q") opens an easy-to-use menu on the LCD as seen below. The Set Custom Button Function is a new feature that allows each button's function to be changed (within a select set of options for each button). I like the 50D grip, but I like the new contour of the 7D considerably better. The area by the top right pair of buttons has been given a more substantial bump-out for your thumb to hold onto. While I find that the bump out extends down slightly too far for my preference (it is not quite as comfortable as the 50D in shooting position - it rides into the base of my thumb a little too much), the added surety of the grip when carrying the camera around is great. It is not unusual for me to be running mountain trails and ridge tops with a camera - capturing as many shots as possible during the early or late day sweet light. The 7D's improved grip makes holding onto the camera easier - there is less risk of dropping it. The START/STOP Button has been purposed for two functions. If the outside switch is rotated to the Live View position, the START/STOP Button turns Live View on and off. If the START/STOP Button is in the Movie position (which immediately turns on Live View in movie mode), the START/STOP Button starts and stops video capture. This button is conveniently located and a nice improvement. The Canon EOS 5D Mark II was first. The Canon EOS Rebel T1i was second. 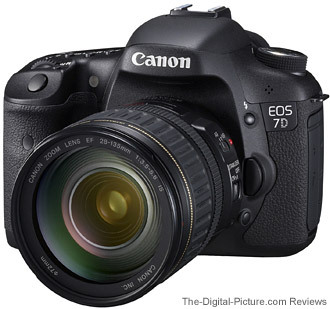 And the Canon EOS 7D is now the third Canon DSLR to be given the HD video feature. While it is not a perfect-for-everyone video package, the 7D, with its huge-to-video-camera-standards sensor, delivers impressive video image quality. As I write this, Canon issued a press release regarding NBC using the 7D and 5D II for capturing the Saturday Night Live show's intro. The large sensor combined with the huge range of lenses available gives even those on a tight budget the ability to create incredible video projects utilizing shallow DOF and low/available light. Press the START/STOP button and get started. What you get with the 7D is most similar to the 5D II's feature set. Here is the list: Full HD video capture at 1920 x 1080 resolution (1080p) with selectable frame rates of 24p (for that cinema-style look), 25p or 30p. 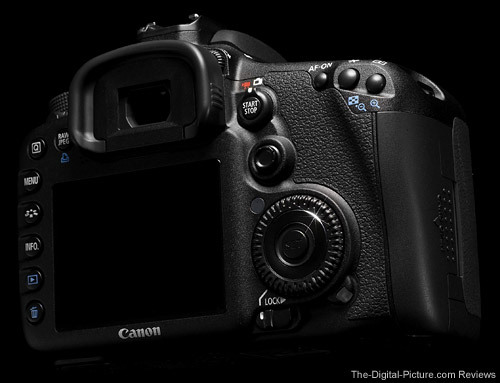 The EOS 7D will also record 720p HD at 50p or 60p (59.94) and SD video at frame rates of 50p or 60p (59.94). The 7D includes a built-in monaural microphone (gets the job done) and a 3.5mm jack for an external stereo microphone such as the Rode Stereo Video Mic. In-camera video trimming is a new feature. Contained in the bulge in the top of the 7D viewfinder is a built-in flash as seen in the ready-to-use position above along with a Canon EF-S 15-85mm f/3.5-5.6 IS USM Lens mounted. The Canon 7D is the highest-end Canon EOS DSLR model to sport a built-in flash, but what is really a big deal is that this flash includes an Integrated Speedlite Transmitter for control of multiple off-camera EOS Speedlites. No Canon 580EX II Flash or Canon ST-E2 Speedlite Transmitter is needed to completely control as many remote flashes as desired. Using one of 4 available channels, take complete control of up to 3 groups of flashes with ratios of up to 8:1. Flash settings are controlled from the 7D's menu which includes an extensive range of controls for both the built in and remote flashes including ±3 stops FEC (Flash Exposure Compensation - the 50D has ±2 stops FEC). I found the remote transmitter capability of the 7D to work fine with two Canon 580EX II Flashes and a Canon 430EX II Flash. 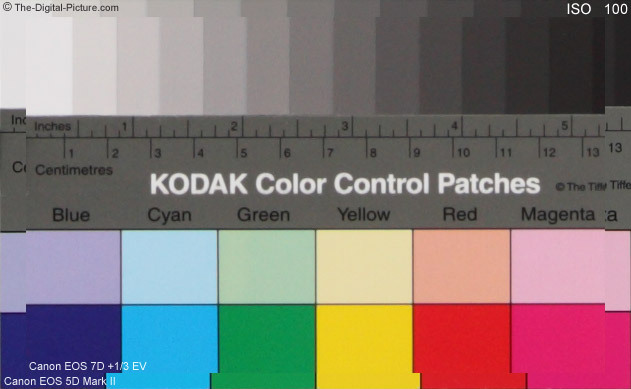 E-TTL II auto exposures were accurate and even non-line-of-site control worked indoors in certain setups. That said, there have been a few reports of a problem where the 7D causes a remote 580EX II to produce a full power dump which results in an over-exposed image. I could not reproduce this effect. Having a built-in Speedlight Transmitter is a big deal in my opinion. It not only saves a significant cost associated with the other ST options, it reduces the size and weight of the camera when in use. Announced and available at the same time as the Canon EF-S 15-85mm f/3.5-5.6 USM IS Lens, the 7D's built-in flash conveniently covers lenses as wide as 15mm (the 50D covered 17mm). 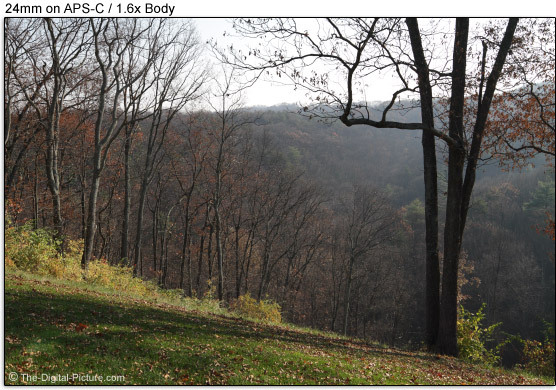 It has a guide number of 12/39 (ISO 100, meters/feet) (the 50D's specs are 13/43). The fastest standard flash synch speed is 1/250 - high Speed Sync flash is supported. Both the 7D and 50D have a full power recycle time of 3 seconds. The Canon 7D has a total of 10 modes available via the top dial. Missing are the 50D's 6 Basic Zone pre-defined modes, added is "C3", an additional custom defined mode. This change makes a lot of sense for the advanced market this camera is targeted for. 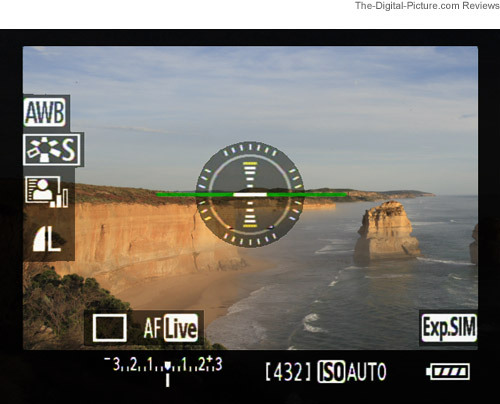 The fully-automatic point and shoot green square mode and near-fully automatic "P" (Program) modes are included along with the recently introduced "CA" (Creative Auto) setting. Creative Auto mode allows the photographer to adjust the shot settings using easily understood words instead of using f/settings and 1/zzz time value shutter speeds. These settings are displayed on the rear LCD while adjustments are being made. 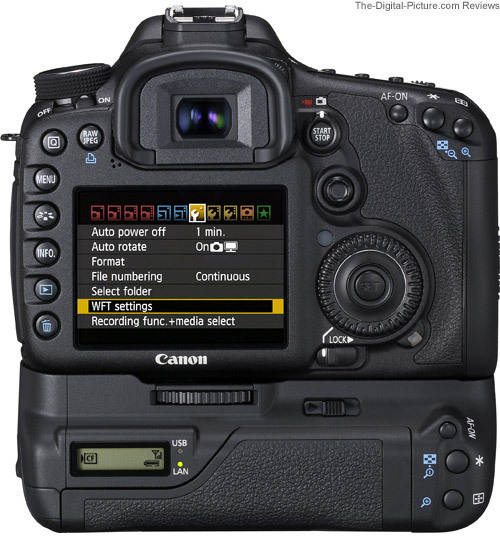 The top button layout follows the Canon EOS 5D Mark II layout and adds a new button "M-Fn" that can be custom programmed for FEL (Flash Exposure Lock), * (Exposure Lock), RAW/JPEG or virtual horizon. Testing to failure is not something I can afford to do with a 7D, but ... While shooting in Acadia National Park, a rogue wave came completely over my back, soaking everything (yes, I'm sure it was very entertaining to watch). I also shot with the 7D briefly in light rain a couple of times. None of these events affected my 7D. Solidly built, but not big or heavy. The 7D is between the 50D and 5D II in size and weighs in at 28.9 oz (820g), which is slightly more than the 50D and even slightly more than the 5D II. The 7D has a very good shutter durability rating. It is rated the same as the 5D II - for 50% more actuations than the 50D, and for 50% less actuations than the 1-Series Mark III bodies. Eight frames per second is very fast. This rate exceeds the 50D by a nice margin and is only exceeded by the 1D Series cameras in Canon's line. To test burst rate, I shoot in M mode (wide open aperture, 1/8000 shutter speed), ISO 100, MF, IS off, lens cap on, all noise reduction off and just enough light on for me to see. Odd thing is, the 7D high speed burst rate drops to 4.3 fps in these conditions. It delivers 42-44 frames at 4.3 fps and repeatedly shoots two quick frames after a .75 sec pause. Canon is aware of this anomaly - and I don't know why anyone other than me that would shoot under these conditions. Those were not the numbers I knew this camera could deliver, so turn on the lights and remove the lens cap. With a SanDisk Extreme IV 16GB CF Card (UDMA), the 7D recorded a solid 8 fps for 24 frames followed by a repeating pause and 2 quick shots. The length of the pause starts at around .35 seconds and increases to about .75 seconds around 9 seconds into the burst. Update: Firmware version 2.0.x enabled larger maximum burst specs than the original firmware. The figures in the chart have been updated for the new firmware figures. Note that the second figure (after the /) represents 128GB UDMA 7 CF memory card specs. Here are the MP3 clips. The 7D sounds solid and crisp but not overly loud. The Live View quiet AF modes are especially quiet. Use the mouseover bar below to see a sequence of 8 fps captures. The above burst sequence was shot with a 7D and Canon EF 300mm f/2.8 L IS USM Lens. The fast frame rate and short shutter lag (only the 1-Series bodies are faster) give the Canon 7D a responsive feel. This is an ideal combination for catching action. 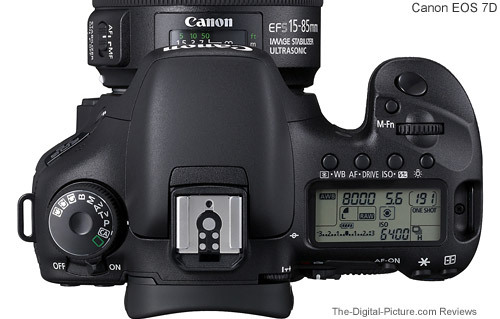 Like the Canon EOS 5D Mark II, the Canon EOS 7D uses the Canon LP-E6 Battery The 7D tracks the percent usage (1% increments), the shutter count and recharge performance for the batteries. Canon rates the LP-E6 + 7D combination at 1000 (800 w/ flash) shots. As always, lots of things affect battery life including Live View (rated @ 220 shots) and other rear LCD use (video), temperature, Image stabilization ... My first battery captured 1601 shots until absolutely dead. I can't tell you exactly what my use was, but there was definitely some Live View and high speed burst shooting in that figure. Canon's rating is very comfortable in my experience. LP-E6 batteries charge in about 2.5 hours in the relatively compact LC-E6 direct-wall-pluggable charger. Want more battery life? Shoot in portrait orientation a lot? Add a BG-E7 Battery Grip as shown above. It accepts two LP-E6 batteries (or 6 AA batteries in the included tray). Better yet, it provides a complete vertical grip with the appropriate buttons. The BG-E7 adds a lot to the size and weight of the 7D, but it is easily installed or removed to give you the best of both worlds. The BG-E7 works great, but the vertical shutter release is slightly more sensitive than the built-in release, the vertical grip is slightly bulky (to accommodate the two batteries) and there is a little flex where the grip and camera meet. Keep in mind that I am most used to the 1-Series solid integrated grip. 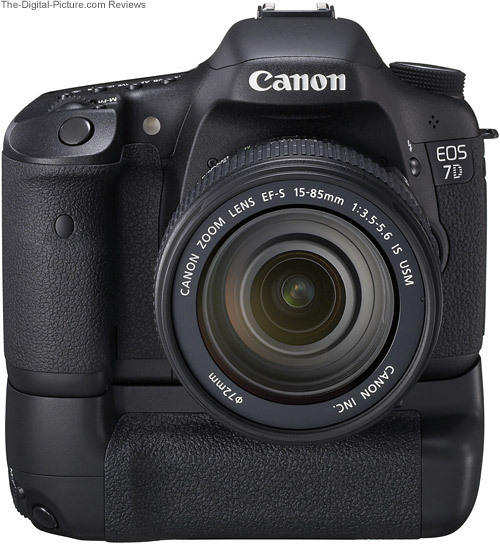 The Canon 7D is compatible with the small, inexpensive Canon wireless remotes including the Canon RC-1 and the RC-5 Wireless Remote. Want to be part of your on family picture? Or just don't want to deal with a remote release cord? This is the accessory you want. 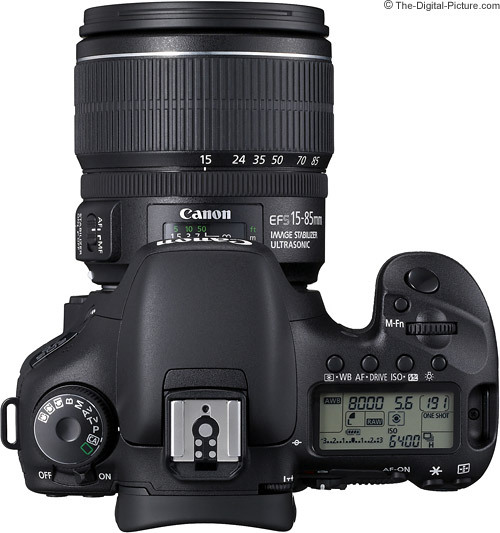 The 7D is shown above with a Canon EF-S 15-85mm f/3.5-5.6 IS Lens mounted. When you buy a Canon DSLR, you are buying into an incredible family of lenses and other accessories. The camera body is of course the base and a lens is the other essential piece of kit. The 7D is available in a body-only or in a kit with the Canon EF 28-135mm f/3.5-5.6 IS USM Lens. The kit lens is decent and is a great value when purchased this way. Because the quality of the lens makes a big difference in the image quality delivered by a DSLR, I recommend buying (now or later), one of the better Canon general purpose lenses available. At this review date, the Canon EF-S 17-55mm f/2.8 IS USM Lens and Canon EF-S 15-85mm f/3.5-5.6 IS USM Lens are my most-recommended APS-C/1.6x lenses with the Canon EF 24-105mm f/4 L IS USM Lens and the Canon EF 24-70mm f/2.8 L USM Lens being excellent alternatives. I should also mention that the support provided by Canon's USA division is excellent (I have no experience with the other Canon divisions). When I call for support, I get an intelligent person who sincerely wants to help me with whatever my question or problem is. Repair service, though I have seldom needed it, is fast and reliable. When I sit down to write a DSLR review these days, I feel like I'm about to write a book. Canon did write one - it's called the owner's manual. It is 276 pages long and is linked below. The 50D owner's manual is 228 pages - the page count difference reflects the additional features found on the 7D. We (you and I) have reviewed most of the new DSLR features found in the 7D, but the list of not-new great features is still huge. AF Microadjustment, Self-cleaning Sensor, High ISO Noise Reduction, Long Exposure Noise Reduction, Highlight Tone Priority, Auto Lighting Optimizer, Peripheral Illumination Correction ... It is easy to get lost in the huge list of features this DSLR has and I'll let you read more about them in the owner's manual. 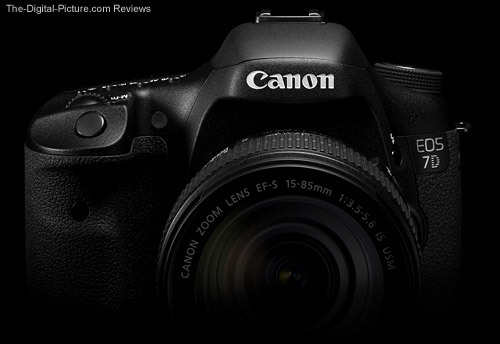 The bottom line is that the 7D is Canon's new king-of-the-APS-C DSLRs - clearly the best yet. Though I would like to see sharper results at lower sharpness settings (set sharpness to "2" or "3" and don't worry about it), the Canon EOS 7D turns in great performance and great image quality in a great package.